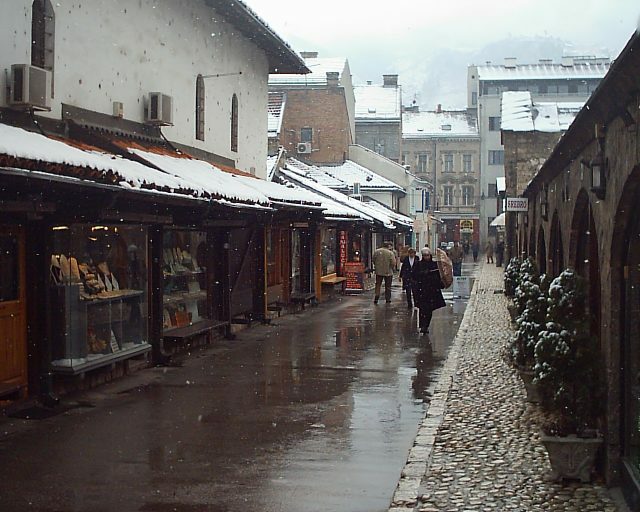 Shops along a street in Baščaršija, a shopping district in the center of Sarajevo, Bosnia and Herzegovina. Ahead of the October 7 general elections in Bosnia and Herzogovina, CIPE experts explain key issues that current and future leaders are being urged to address by the private sector and civil society. A newly published report provides specific recommendations for economic and democratic reforms.The country’s 3.3 million voters must choose from candidates representing 67 parties, as well as 34 independents. Information from 20 of those parties was included in the CIPE-partner produced Glasometar (Vote-o-meter) webpage, which asks a series of questions on social, economic, and political issues and, based on the answers, matches the user with a party platform corresponding to his or her preferences. Although Bosnia and Herzegovina has achieved some economic growth, with new jobs, opportunities, and public services becoming available to its people over the past few years, many challenges still lie ahead. Low trust in the rule of law, weak state institutions, widespread corruption, a poor business environment, inefficient public administration, and high unemployment are among the key problems. In this context, the Sarajevo-based Center for Policy and Governance (CPU) and Zasto Ne, both leading public policy think tanks working with the Center for International Private Enterprise (CIPE), recently published a policy paper highlighting the need to step up democratic and economic reforms that respond to people’s needs. The policy paper introduces a concrete set of measures requiring immediate attention from future governments. A series of interviews and meetings with 30 organizations and individuals from civil society and the business community conducted from February to May 2018 revealed a consensus on eight reform priorities to grow the economy and bring prosperity. The priority areas include rule of law and good governance, public finances, taxation and fiscal sustainability, business climate and competitiveness, labor market, social welfare reform, public administration reform, education, and healthcare sector reform. For example, one-stop-shop business centers would improve Bosnia and Herzegovina’s business climate and support entrepreneurship and job growth. Such centers would offer a variety of services to entrepreneurs in one location, saving them considerable time, effort, and money. What is most important in these elections is for the political parties, instead of the usual fear mongering and political populism, to present the voters with solutions to key economic and social challenges, and to gain their trust by adopting responsible economic policies. By presenting the set of priority measures today, we wish to contribute to the discussion on the need to step up the democratic and economic reform. Civil society, academia, and business recognize their responsibility for Bosnia’s future, but it lies in the hands of politicians who should be held accountable for their inaction. CPU and Zasto Ne have driven this unique initiative to voice the concerns of the local private sector and to communicate them to future policymakers. CIPE’s partners will now offer their expertise and analysis to help the political parties adopt a set of proposed reform and policy solutions to the country’s main socio-economic challenges. This effort will encourage pre-election dialogue to address those challenges and encourage policymakers in Bosnia and Herzegovina to continue pursuing responsible economic policies following the elections. Martina Hrvolova is a Program Officer for Europe at CIPE. Connor Leach is a Program Assistant for Europe at CIPE.